UPS is our preferred provider. UPS will be used in MOST INSTANCES EXCEPT for large, heavy or bulky items (over 150 lbs. or more than 165 inches in length and girth combined). These exceptions will be shipped out by commercial truck (See Truck Freight Policy). Customer will be responsible for inspecting for any damages or shortages and reporting to K&M Manufacturing as soon as possible. 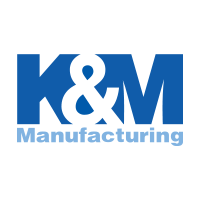 K&M Manufacturing will prepay freight on shipments. Freight charges will be added to the customer's invoice. We pass along great savings on freight by utilizing the carriers that we have negotiated volume discounts with. Customer will be responsible for inspecting shipment at delivery. If a shortages, damage by carrier or concealed damage is detected, please call K&M Manufacturing as soon as possible to report and start a claim. Please retain any cartons, packages, or related data until inspection has been made by the carrier. The customer is responsible for carefully examining all shipments before signing a bill of lading or delivery sheet. The customer must note all damages and shortages when signing. If the customer detects any damage or shortage in the shipment, the damage or shortage must be recorded on the bill of lading or the delivery sheet and the carrier's driver must sign and acknowledge this record. The customer must retain a copy of the signed bill of lading or delivery sheet and call K&M Manufacturing as soon as possible to start the claim process. Yes, K&M Manufacturing will ship to most countries. Please call 800-201-2358 for rates or email the sales team at sales@tractorseats.com. Residents of Iowa, Kentucky, Minnesota, North Dakota, South Dakota, Texas and Wisconsin must pay applicable sales tax. If you are a tax-exempt customer in Iowa, Kentucky, Minnesota, North Dakota, South Dakota, Texas or Wisconsin, please send us a copy of your state’s exemption certificate. Please contact the K&M Sales Team for the necessary tax exempt forms. If your tax-exempt form is not on file, you will be charged tax. If damage by carrier or concealed damage is detected, please call K&M Manufacturing at 800-201-2358 immediately to report and start a claim. K&M Manufacturing is responsible for filing damage claims with the carrier. Please retain any cartons, packages or related data until inspection has been made by the carrier. K&M Manufacturing will notify you as to the disposition of the damaged merchandise. Whenever possible, please reuse the original shipping and package materials from the product you received. The customer is responsible for carefully examining all shipments before signing a bill of lading or delivery sheet. The customer must note all damage and shortages when signing. If the customer detects any damage or shortage in the shipment, the damage or shortage must be recorded on the bill of lading or the delivery sheet and the carrier’s driver must sign and acknowledge this record. The customer must retain a copy of the signed bill of lading or delivery sheet and call K&M Manufacturing at 800-201-2358 immediately to start the claim process. Please DO NOT refuse shipment. This will only delay your receipt of credit or replacement of damaged good.